Makeba, who was affectionately known as Mama Afrika, was also an actress and political activist. She was born in Johannesburg in 1932 and her career highlights included singing for presidents and the Pope three times. In 1966 Makeba became the first African artist to win a Grammy Award for her album with Harry Belafonte, An Evening With Belafonte-Makeba. Some of her most famous songs include Pata Pata and the Click Song, which have been sampled and used many times over in popular music. 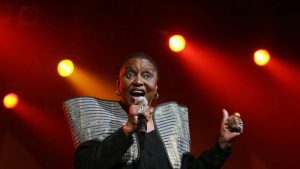 Makeba died at the age of 76 in November 2008 after suffering a heart attack after a performance in Italy. The post Makeba’s birthday celebrated by Google appeared first on SABC News – Breaking news, special reports, world, business, sport coverage of all South African current events. Africa's news leader..